A new update of GPU Caps Viewer is out. This new version adds the support of latest video cards such as Radeon HD 5450, HD 5830, HD 4290 and GeForce GT 3xx. the GPU temperature reading has been improved and clocks reading are now regularly updated (update period: 2 seconds). 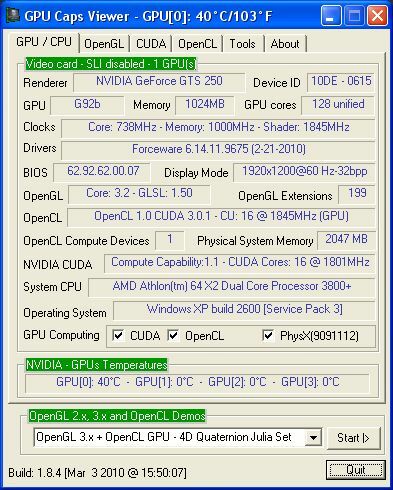 GPU Caps Viewer is a graphics card information utility and provides detailed data about GPU, OpenGL API support, OpenCL API support and CUDA (GeForce cards). New: added GeForce GT 320/330/340, Radeon HD 5450, HD 5830 and HD 4290 (AMD 890GX) to GPU database. New: GPU clocks reading is now regularly updated (interval = 2sec). Change: updated with PhysX 2.8.3 SDK. Change: temperature reading for ATI graphics cards. Change: clocks reading for ATI graphics cards (now for example, under WinXP, Radeon HD 4850 clocks are displayed). Bugfix: number of geometry shader texture units was wrong in OpenGL tab. ZoomGPU (the detection engine used by GPU Caps Viewer) has been updated in version 1.4.1 as well as GPU Caps PRO in version 1.8.4. I have Crossfire 5870’s. I know they support OpenCL which is why I downloaded the app as I am tired of CUDA applications flooding the market with it’s proprietary stink that damages the industry by not going with open standards. However, the app recognizes my card correctly but says I do not have OpenCL. Could my driver be at fault? I have the new 10.5 drivers. Please let me know as I would love to use the app.